The backdrop for hedge-fund strategies appears to be turning more positive, according to Brooks Ritchey, head of portfolio construction, K2 Advisors. Here, he explains why hedge-fund strategies may be entering a “silver era”, and why the US Federal Reserve’s projected interest-rate normalisation could present opportunities in this sphere. The macroeconomic backdrop for hedge-fund strategies hasn’t been ideal for a number of years. Now, we think this may be changing. Monetary policy looks to be shifting in some countries, currencies are becoming more volatile and geopolitical risks have intensified of late. We think these fundamental elements could drive hedge-fund strategies’ alpha1 and open up new opportunities for investors in this space. In our view, low interest rates are often an overlooked factor in regard to hedge-fund strategy performance. Now, as US interest rates are making slow but steady strides upward from historic lows, we think certain hedge-fund strategies may be finding new opportunities to show their mettle. If the US Federal Reserve (Fed) continues to raise interest rates this year and next, we think it could cultivate an environment for certain hedge-fund strategies to flourish. Rising interest rates have historically been associated with lower cross-asset correlations, creating more alpha opportunities for hedge funds. Additionally, rising interest rates have typically led to future periods of above-average alpha, as represented by the Hedge Fund Research Index Fund Weighted Composite Index (HFRIFWI)3. 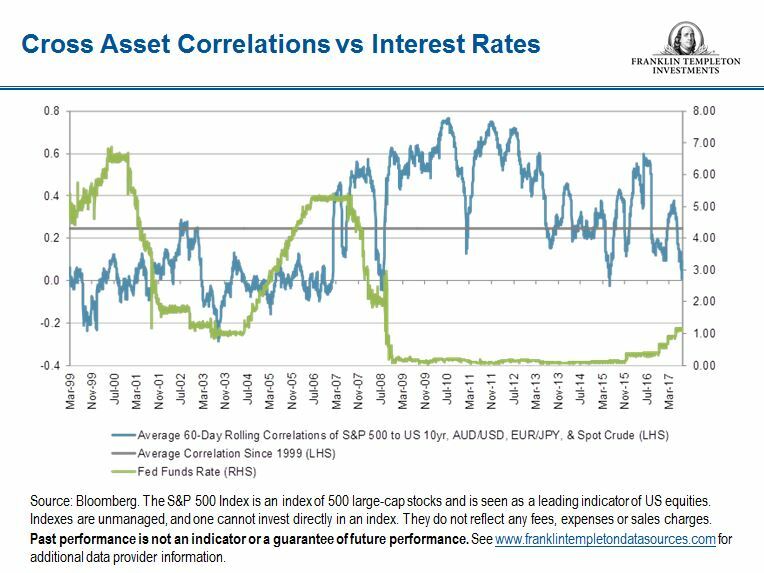 The illustration below shows a positive correlation between alpha and interest rates. The average level of alpha rose to the highest level at 14.07% during the measured period, where the US 10-year Treasury yield stood at 7.05%.4 Based on what we’ve seen in the past, we think hedge-fund managers could have the opportunity to capture that alpha, or outperformance, as US interest rates continue to rise. Global geopolitical risk is another element that we believe should drive a change in the landscape for hedge-fund strategies. On the back of recent geopolitical tensions, major currency spreads have widened, and historically wider spreads have benefitted hedged strategies’ alpha. This is particularly noticeable within the Group of Seven (G7)5 economies, since they coordinate and attempt to manage major exchange rates in a way that leaves their currencies closely linked. As a result, we might not yet be in the golden era for hedge-fund strategies—the most-ideal environment for managers to capture alpha—but we could be approaching the silver era, where favourable opportunities are starting to appear. 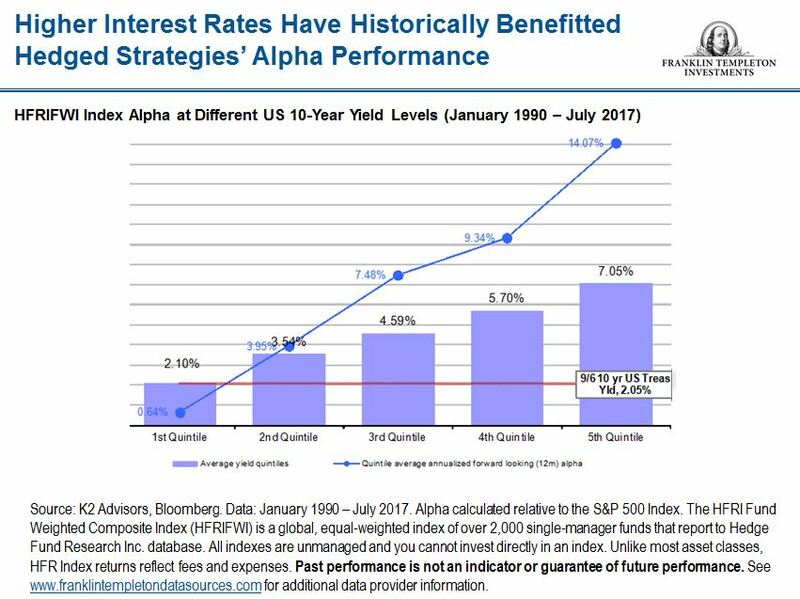 Interest Rates: Higher interest rates have historically benefitted and supported alpha in hedged strategies. When interest rates are low, there’s little incentive for companies to clean up balance sheets and restructure debt. Large G7 Currency Movements: Hedge-fund managers may benefit from increased currency volatility via spread and pairs trades, as well as from greater price dispersion in securities globally. Wide Variances in Equity Sector Price-Earnings (P/E) Ratios: The wider the gap, the bigger the opportunity for managers to potentially benefit from equity sectors that show a below-average P/E ratio6, which indicates that a sector may be undervalued, or conversely from above-average sector P/E ratios, which may indicate inflated value. Not all hedge strategies will fare equally as conditions change. We expect the event-driven hedge-fund space, for example, may face headwinds as central banks globally begin to normalize interest rates. Event-driven hedge funds often seek to profit from merger-and-acquisition (M&A) corporate activity, which could be diminished as interest rates rise. Global macro strategies, however, may benefit from rising rates. The global- macro space has seen an increase in trading volume over the last two months, and we anticipate this trend will continue. To conclude, we’ve seen evidence that the current market landscape could become a nurturing environment for certain hedge-fund strategies, but we’re only just at the beginning and believe more opportunities could crop up during this silver era. 1. Alpha is a risk-adjusted measure of the value that a portfolio manager adds to or subtracts from a fund’s return. 3. Alpha calculated relative to the S&P 500 Index. The HFRI Fund Weighted Composite Index (HFRIFWI) is a global, equal-weighted index of over 2,000 single-manager funds that report to Hedge Fund Research Inc. Database. All indexes are unmanaged and you cannot invest directly in an index. Unlike most asset classes, HFR Index returns reflect fees and expenses. Past performance is not an indicator or guarantee of future performance. 4. Alpha is calculated against the S&P 500 index. 5. The Group of Seven is a group consisting of Canada, France, Germany, Italy, Japan, the United Kingdom and the United States. 6. The P/E ratio for an individual stock compares the stock price to the company’s earnings per share.